The first product we produced, and in many ways still the best. The true essence of Minnesota apples in their finest form, with a bit of sparkle. With no added sugar, this is a bracing, refreshing drink for a beautiful Minnesota day, winter or summer. Available at our bottle shop at 3016 East Lake Street. $12.99/ 22 oz. bottle plus tax. 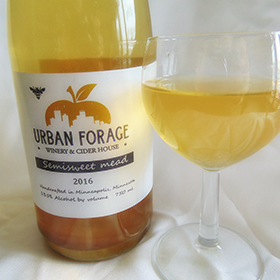 Our semisweet sparkling cider is a fruity and tingly version of our dry cider, made from the same local apples, but lightly sweetened and lightly sparkling. 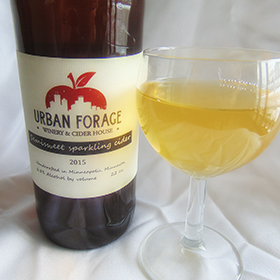 It’s gluten-free and semisweet in the style of a British cider and not overly carbonated. Enjoy it with food and friends. Available in select Twin Cities liquor stores and at our bottle shop. $12.99/ 22 oz. bottle plus tax. Mead! Honey Mead. Made from honey, purified water and yeast. A heavy-bodied slightly sweet nectar of the gods. You need not wear tights or chainmail to enjoy mead. It’s quaffed by folk of all sorts. Higher alcohol than a cider, so please drink responsibly! $17.99/750 ml. bottle plus tax. We were fortunate enough to receive a bounty of spent gin botanicals- the spices that give gin its distinctive flavor- from Lawless, a distillery located in neighboring Seward. They included juniper berries, coriander and black pepper along with other herbs. 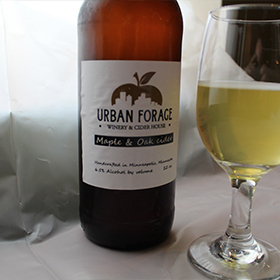 When we infused our dry cider with them, it created a tongue-tickling combination. A truly unique cider unlike any other we’ve made. Available at our bottle shop and at select liquor stores. $12.99/ 22 oz. bottle plus tax. 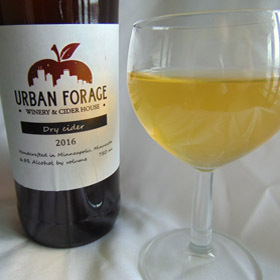 Aged in an oak barrel with toasted French oak chips, then lightly sweetened with organic maple syrup, this cider is a symphony in your mouth. On tap while it lasts, and in 22 oz. bottles for $12.99 in our taproom. Blackcurrant cider: exactly as it sounds, and delicious! 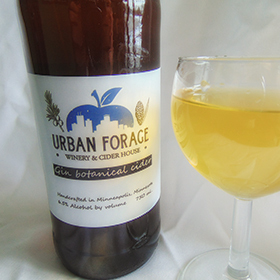 Local currants and local cider combine to make something gorgeous on your tongue. Red grape wine: Available now in our taproom. A Minnesota-grown Frontenac wine with notes of stone fruit and leather. 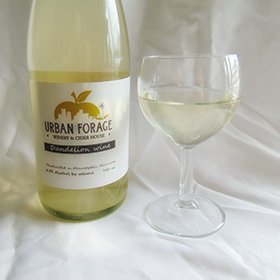 Rhubarb wine is back! No room above, but it’s here! We used to sell bottles to a distributor who resold them to liquor stores, but we found that we did much better selling them on our own. So if you’d like a bottle or growler of any of our products, the only place to buy them now is at our winery and bottle shop at 3016 East Lake Street in Minneapolis.